Haven’t Western powers done enough damage to Libya without poking noses into the current power play! It was military intervention on the part of France, Britain and the US that in 2011 succeeded in overthrowing Muammar Gaddafi who despite his eccentricities presided over a stable and prosperous nation whose nationals enjoyed a high standard of living. President Obama admitted that Libya was the worst mistake of his presidency. Donald Trump has described Obama’s intervention as “a catastrophe” rightly saying Libya would have been better off under Gaddafi. Doctors without Borders complain that refugees and migrants detained in Tripoli’s detention centre, among them more than 100 children “are suffering from alarming rates of acute malnutrition … locked in a small room with only 0.7 sq metres of space per person.” EU representatives have acknowledged the terrible conditions but because “Libya is a sovereign country” with which Europe cooperates there is little they can do. Not content with bringing this oil-rich North African nation to its knees, America, the EU and the United Nations continue to support the ineffective Government of National Accord or GNA operating out of Tripoli as opposed to the Benghazi-based rival authority led by dual US-Libyan citizen Field Marshall Khalifa Haftar whose army is currently engaged in a military thrust to take the capital. Yes, Haftar is a strongman. He heads the Libyan National Army and the country’s key oilfields. That said he remain popular in the east seen as a man who delivers security and one who is dedicated to eradicating terrorism and unifying his divided nation. Benghazi residents rightly or wrongly accuse the Tripoli government closely allied with Turkey and Qatar of being in bed with the Muslim Brotherhood. It was made clear to Haftar some years ago that he was not a welcome participant in the so-called Government of National Accord, which, as we see today, was a major mistake. The GNA has failed to build an effective military or police force, has not succeeded in bettering lives and elections held in 2014 with the aim of strengthening state authority were marred by violence; only 630,000 bothered to cast their ballots. The question is why the international community, with the exception of at least three major regional players and France, continue to view the GNA as the only game in town. 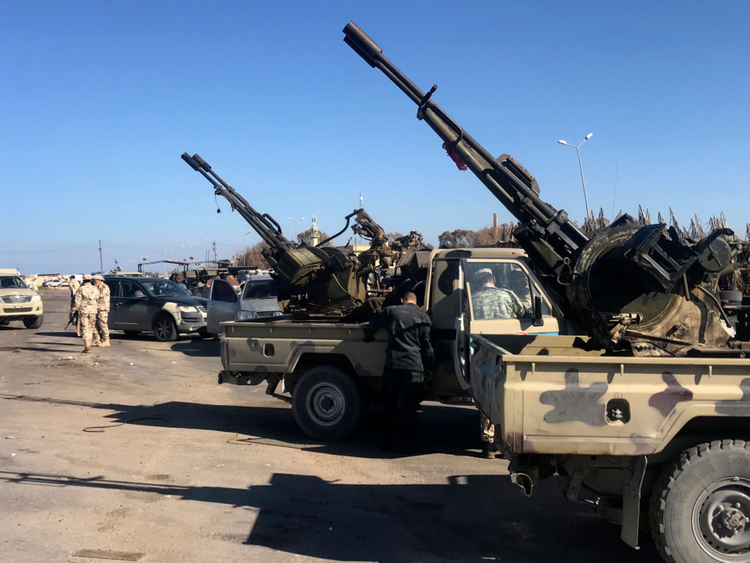 That said there are no official noises of approval for the Haftar offensive even from his allies believed to have supplied him with weapons required to combat terrorism. There are fears of a full-scale civil war in the offing which nobody wants. Tripoli’s residents are afraid. Shops are shut. People are staying in their homes. Now that he has displayed his military prowess, his negotiating arm is strengthened. He should withdraw his troops and invite all interested parties to sit around the table. The United Nations is still intent on going ahead with planned peace talks this month. I won’t hold my breath. Like my Welsh grandmother would say, the UN is all talk and no trousers. Since 2014, Secretaries-General have tried to put Humpty together again with no success whatsoever. Maybe, just maybe, this time it will be different. A letter penned by Libya’s former ambassador to the UN Ebrahim Dabbashi to the UN’s Special Envoy Ghassan Salame is not very reassuring. It warns that “some Libyan parties backed by the active members of the UN Security Council are trying to hijack the national conference” to retain power. He advises Salame not to fall for their games. There are no magic bullets or angels-in-waiting to bring a swift end to the woes of long-suffering Libyans. The international community has had eight years to make a difference only to witness worsening chaos. The West helped break it. Give Libyans the chance to fix it.